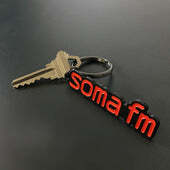 We have some really nice keychains available! Not some cheap promo items, these are custom die-stamped engraved and enameled metal keychains. Get yours with a $25 (plus postage) donation.